In honor of Captain America: Civil War coming out, I think this pin is appropriate. The Williamsport Sun-Gazette made this pin for the 2015 Little League World Series. 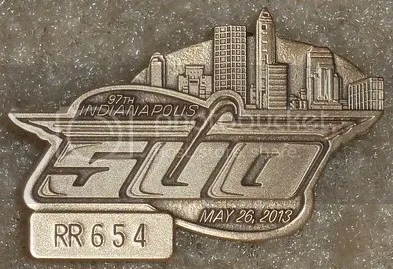 Each year they come out with a whole slew of pins you can buy. 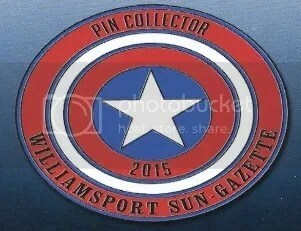 The Sun-Gazette booth that was setup at Little League last year wasn’t selling this particular pin though. I think you could only get this one at their downtown location. As you can easily tell, the pin is designed to look a lot like Captain America’s shield. 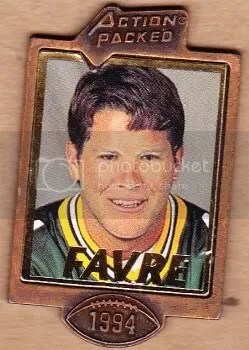 I own a bunch of Sun-Gazette pins, but not this one. The only time I’ve seen one on eBay was in a lot. By the time I saw it the auction had ended. Despite not being seen much, I doubt its very rare. The lot that had this pin in it sold for a couple dollars. I find it cool when superheroes and sports stuff are combined. Its becoming more popular. This weekend the San Francisco Giants are giving away Captain America bobbleheads. Instead of being the classic red, white, and blue, the color scheme is white, orange, and black. I really hope this trend continues. Action Packed has long been out of the sports collectibles business, but during the early to mid 90’s you could find their stuff all over the place. In 1994 they produced a product called Badge of Honor. Each pack contained four pins. Just like a lot of sports collectibles of this time, they were overproduced to the max, and can be found today for very little money. I say put old and rare pins into newer cards. Tonight the Phillies will be wearing an HK patch on their uniforms in honor of Harry Kalas. They plan to wear them all year. Usually they place a patch like this on the sleeve, but this one will be placed on the front of the jersey near the heart. I plan to display this HK patch on Sports Card Info for the remainder of the baseball season. Please feel free to copy & paste the HTML code below to display the patch on your own website or blog.